As I was preparing for an upcoming genealogical presentation, I did an internet search for the top FREE genealogical websites. Specifically, I was looking for sites that were suited for the beginning researcher. This is a short yet, comprehensive list that will allow you to explore (or for some revisit) a large range of resources that will help you on your journey. Over the next 9 days I will highlight a different website. Take time to visit the website and see what it has to offer. Every researcher should create their own toolkit of resources. This toolkit should expand and change overtime as your needs and research changes. Explore a directory to websites containing free genealogical resources for every US state and most counties. Quality, content and design varies from site to site. You’ll commonly find what local resources exist and how to access them, along with indexes to cemetery, marriage and other local records. Share your own records on these sites, too. This is a site with a lot of depth. You can search by state and by county as well as connect to researcher who are searching specific areas. Code services offered: H =how-tos, R =records; S =share your data and T =tools. Bonus – http://www.kygenweb.net/ KYGenWeb Online Kentucky Genealogy Resources. Take time to check out this wonderful resource. Do you wish you could attend a great genealogy fair, but you lack the time and money. Well here’s your chance. This fair is as close as your nearest wifi connection. 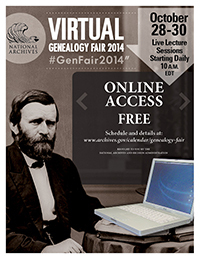 Visit the National Archives for the 2014 Virtual Genealogy Fair on October 28, 29, & 30, starting daily at 10 a.m. eastern time. This will be a live broadcast via the Internet so you can ask our genealogy experts questions at the end of their talks. The entire event is free and open to all, so there is no registration. I’m excited! I can’t wait to see what great information I’ll be able to glean.